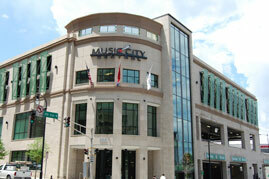 Music City Central, the state-of-the art transit center, located on Charlotte Avenue opened in 2008 and replaced the outdoor transit mall on Deaderick Street. This building provides a comfortable place for passengers to await the arrival of their buses. The station serves up to 20,000 passengers each weekday and features an onsite Dunkin' Donuts. 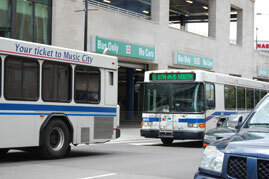 For bus schedules and information on Ride Share Programs, Access Ride, Titans' End-Zone Express, Airport service, and Bike and Ride, visit the Metropolitan Transit Authority website at www.nashvillemta.org. Trips to and from downtown and the Nashville International Airport (BNA) are a flat $25 rate. Taxis are easy to hail and multiple taxis are "on call" at most of the downtown hotels.